Indian cuisine boasts of a wide array of savories ranging from simple plaintain chips to the irresistible samosa. 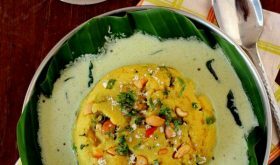 Every region of India be it North or South, East or West, has its own range of traditional savories which can be nibbled on any time of the day and make great accompaniments with coffee, tea or beverages/juices/cocktails. 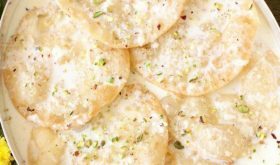 Preparing traditional savories at home has drastically reduced over the past few years with most of them being available at home foods outlets in almost every city. I reminse my childhood days of the wonderful aromas emanating from ammammaâ€™s and ammaâ€™s kitchens cooking savories like pakodas (fritters), jantikalu, muruku or chakli etc almost every other day and stored in big dabbas and how we would go scrambling into the pantry, immediately on coming back from school, with pangs of hunger, to devour them. Home made traditional savories do have their advantages over store bought ones in terms of freshness, price (costs much less), can be prepared suited to our palate and stored for at least 2-3 weeks. We can never be sure of the store bought ones which most of the time lack the flavor and freshness of home made savories. Inspite of it we find that most homes are going in for store bought savories probably out of sheer convenience. I guess,itâ€™s a personal choice. I ,for one, would prefer to prepare our traditional savories like jantikalu and murukku at home and very rarely pick up store bought ones. 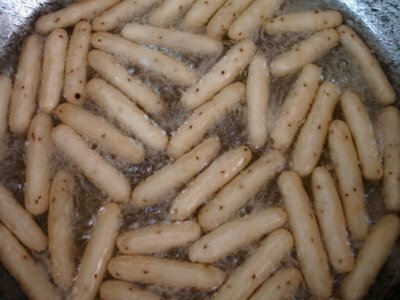 Palakayalu are a rice based, dry and crispy snack popular in Andhra. They are a hit with children and sometimes given to teething toddlers who nibble at them to remove the irritation they usually face during teething. They can be made both sweet and spicy.T odayâ€™s recipe is a salted version which is crisp with a slightly sweet flavor. If you want a spicy taste, add a tsp of ground green chilli paste to the dough. Add salt, sugar and 1 tbsp of oil to water and bring to a boil. Add the rice flour to it stirring continuously till it forms a thick mixture and turn off heat. Cover and keep aside to cool. Once cool add the vaamu and mix the dough well kneading for 2-3 minutes to form a smooth dough. Make small balls and roll them into (approx 2â€ ) longitudinal shape. Heat oil in a deep frying pan and test the temperature of the oil by dropping a small ball of dough into the oil and if it sinks to the bottom, it means the oil isnâ€™t hot enough. If the ball springs to the top with bubbles all over, it means that the oil is ready to deep fry the palakayalu. Drop the palakayalu (about 20 or so depending on the size of the vessel) gently into the hot oil and keep flipping them over till they are golden brown and crisp. 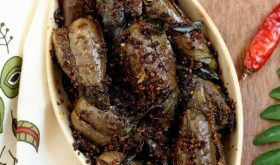 Drain onto absorbent paper and when cool, store the fried palakayalu in airtight containers. Note: Before you start deep frying them, ensure that you shape out the entire dough into longitudinal shapes and keep them covered. Deep fry them batch wise depending on the size of the deep frying pan. Don’t add too many at once. Enjoy a great tea time snack! Sailu, chala bavundi e recipe, nenu tapakunda chestanu, ma pillalaku ku ishtamu snacks. one thing miru recipe 2 times repeat chesaru. Thank you,Lakshmi.Mee pillalaku palakayalu tapakunda nachutaayi…:). I do make palakayalu for krishnaastami in round shape.This shape looks mor attractive. Like vineela said i do make palakayalu in a round ball shape this shape is really cool,thanks for sharing a new shape as kids love to see something different in their food. These look yummy! Thanks for the recipe. Palakayala gurinchi eppudu vinatame sailu. And the one time I ate they were sweet. Had no idea that there is savoury version of it..chaala bavundi recipe. Love this savory type of pala kayalu, Sailu. I didn’t see spicy version of palakayalu ever before. This one is perfect for us since neither of us has the sweet tooth. Looks like the perfect snack to me – yum! Did you by chance graduate from St. Joseph’s, Vizag? Just curious! Your style looks familiar. New to me too. My grandmother makes something similar, but in a different shape and it has black sesame seeds & eggs in it. I remember eating these when I was a kid at a family friends house. My mom never made these. These sound so easy to make. This is definitely going on my must try list. Sailu garu, we will try these out this weekend. As our trip to India approaches this end May ’06, our desire for all things Indian and obviously, Telugu/Andhra/Hyderabadi, seems to be increasing! 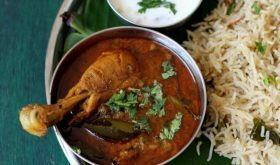 This particular recipe makes me think of the the “Swagruha Foods” phenomenon that seems to be sweeping our AP these days. I will be carrying my “photography junk” (as my wife likes to call it!) and I’m beginning to think that the ‘Swagruha Foods’ phenomenon might me an interesting topic. This looks beautiful. I’m definately to make them. Looks very yummy … I prefer home-made snacks compared to store-bought ones!! sailu will it be crispy without adding butter, is plain oil sufficient. Planning to make it this weekend. Priya,you can add oil or ghee or butter and for every 2 cups of rice you will need 2 tbsps of ghee/oil or butter. Since its a deep-fried item ,I have mentioned it as 1 tbsp oil in the above recipe keeping in mind the calorie-conscious. I usually add about 2 tbsp of home made ghee (as its my 3 year old who eats them and not me..:)) but oil is equally fine and will not bring down the flavor at all..:). Priya,butter or oil,it makes no different which kind of fat you use. I am Sailaja from CA,USA. I was really impressed seeing ur site.Its excellent.Keep posting all Andhra Vantakalu. mee site chala bagundi. naku chala baga nachindi. intha clearga with all pictures u are able to explain. we r very happy. keep continuing. me site nenu regular ga follow avuthanu kani ide first nenu post chestondi. 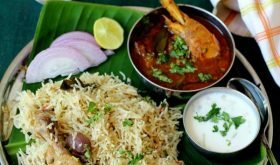 i tried this recipe chala baga vacchindi ma husband usual ga snacks anta istam ga tinaru kani idi matram baga nachindi. meeru present chese style inka pictures all are excellent. sugar 1 1/2 tsp r 1 1/2 cup? Its definitely 1 1/2 tsp. You can also avoid this if you want. I just found your website and the food looks absolutely delicious though I only the vegetarian recipes. Would you mind if I used some of your recipes to share with my fellows vegans at my site and post it on the blog? I will leave the link to your website with it. hi sailu, i tried to make these yesterday. First batch came out fine. When the second batch was frying there were big bubbles and the oil splattered all over my kitchen. I was safe as I stayed away when this happened. Just wanted to know what might have caused this to avoid it in future. Now I am afraid of deep frying anything. My mom wanted to make these and my dad pitched in to say that we need to add milk to dove and he also said that is the reason they are called ‘Pala’kayalu. I told them that I can quickly find out who is correct by searching ur website. Like always you didn’t disappoint me. Thanks…My mom is going to try them tomorrow…!! So do u know…if there is alternative recipe that calls for some milk?? Hi Sallu , I tried to make this but while I was frying there was a big bubbles and the oil splattered all over my kitchen. I just want to know what might have caused this to avoid it in future.